After a long process of working out the details, the 2008 Band of Bloggers fellowship is open for registration! The window of registration will be from February 18-March 31, 2008 (a total of six weeks). So be sure to help us get the word out to all the bloggers attending T4G this year. The Galt House (where the T4G conference was held in 2006) has agreed to host this year’s meeting and will be catering the attendees with a boxed lunch. Those of you who have been around downtown Louisville know how difficult it is to find a place to eat, moreover, a place that is affordable. We are committed to making the cost as affordable as possible, but given that we are working with no budget or any outside financial support, a small registration fee is required. Included in this cost is lunch and other treats TBA. If you plan to attend and cannot afford the $15, please email us at thegospeltrust@gmail.com. The current conference room will allow us to seat approximately 150 people. Therefore, it is important that you register early. If perchance, we exceed this capacity in short order, we will pursue the possibility of a larger meeting room. We would like to make this open to as many as possible, so please do not procrastinate in signing up! The Galt House is located just one block away from the Kentucky Convention Center and can be accessed indoors (less than a five minute walk). For those traveling from the airport, I have created a Google Map and have pin-pointed the locations for both the Galt House and Convention Center. For those of you concerned that you will miss the first session of T4G, it does not begin until 2:30, and Band of Bloggers is scheduled to end at 1:30 p.m. that afternoon. The purpose of this event is to provide all attending bloggers of the 2008 Together for the Gospel conference an opportunity to meet, fellowship, and engage in a fruitful, gospel-centered discussion with some of the leading bloggers today. It is our desire that you to be refreshed personally, connected corporately, and fueled Christocentricly. May the Lord use this time to burn in our hearts a love for the gospel and for one another. Lord willing, I will be in attendance, and perhaps I will meet some of you there. NKJ Romans 16:17-18 "Now I urge you, brethren, note those who cause divisions and offenses, contrary to the doctrine which you learned, and avoid them. For those who are such do not serve our Lord Jesus Christ, but their own belly, and by smooth words and flattering speech deceive the hearts of the simple." I recently ran across a video of John Piper explaining Paul's meaning in this passage, in particular verse 18, and I thought the blog's readers might appreciate it as much as I did. Hello to all the blog's readers! I just wanted to let you all know that I have uploaded all of the resources I had previously made available at my old website to the new PastorThroop.com site. I have also added many new resources, including PDF files and e-Sword Topic Notes files. These include many Reformed materials, from systematic theology texts to sermons. Recent additions include "Christian Apologetics - An Introduction," "The Relevance of Christianity: An Apologetic," and "Blaise Pascal: An Apologist for Our Times," by Rick Wade of Probe Ministries. In addition, I recently added Basic Christian Doctrine from Curt Daniel, pastor at Faith Bible Church in Springfield, Illinois, as a Topic Notes file. So, check out my Downloads page if you are interested. Global Bible Reader helps you stay on track with your daily Bible readings by onnecting you to a community of people all following the same reading schedule. Global Bible Reader presents you with today’s reading, keeps track of your progress, and lets you communicate with everyone else who’s reading with you. 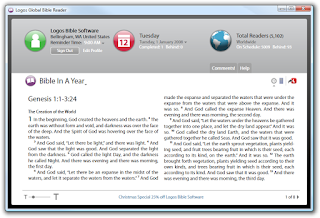 Once Global Bible Reader is installed, it displays an icon in the taskbar notification area (near the clock). Double-click that icon to open Global Bible Reader. Browse the available schedules by selecting them from the drop-down list (with a purple book icon) in the upper-left. The calendar icon (in the top-middle of the window) allows you to look at previous and upcoming readings in your chosen schedule. For those interested, their is actually a Bible Reading tool included in e-Sword as well, with which you can set up a daily Bible Reading Plan for the whole Bible or just for a particular book or part of the Bible. But this doesn't sit in your system tray to remind you. Nor does it help involve you with a wider community of readers. But, on the other hand, since it doesn't sit in you system tray, it also doesn't use any resources until you tell it to.